The understated elegance and comfortable confines that have become synonymous with a Westin resort perfectly complement the tranquil and beautiful setting of The Westin Lagunamar Ocean Resort in idyllic Cancun. Emerging from the powdery white sands of Mexico’s world-famous destination, the Westin Lagunamar Ocean Resort offers all of the modern amenities you would expect from a world-class resort and an exciting immersion into local adventure. A short walk from your private villa you will discover the mysterious ancient ruins once inhabited by Mayan royalty. Or, you can indulge in delicious culinary delights and shop the day away at La Isla, the area’s renowned dining and shopping venue. 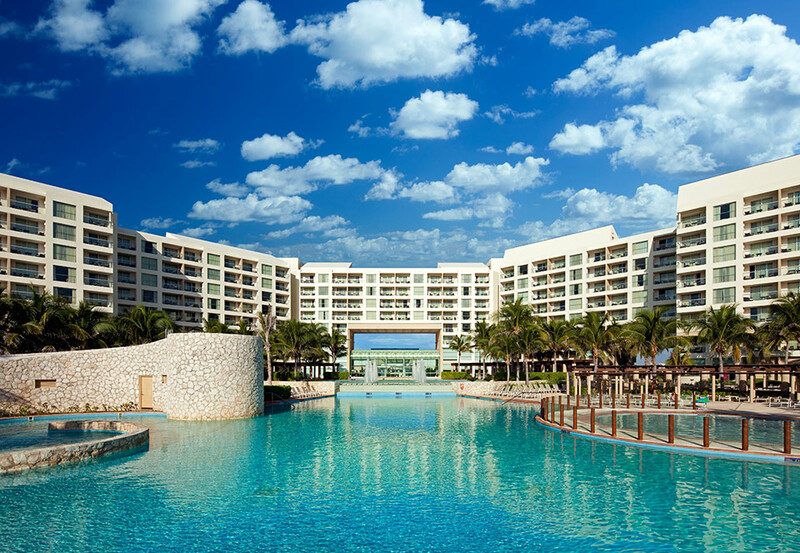 Of course, with a Westin Lagunamar Ocean Resort timeshare, you can also spend your days relaxing by the sparkling pools, diving in the turquoise waters of the Caribbean, meandering along white sand beaches, and experiencing all of the recreation activities of this beloved Mexican paradise as well. At The Westin Lagunamar Ocean Resort, reinvigorate your mind, body, and spirit in your instinctively designed, spacious villa. If you buy a Westin Lagunamar Ocean Resort timeshare, your luxurious studio, one bedroom, or two bedroom Cancun villa can easily accommodate up to eight people. Each villa comes adorned with a private oceanfront balcony to enjoy the miles and miles of Caribbean views, spacious dining and living area, flat screen TVs, signature Westin-style king-size beds, kitchen, and a washer and dryer to enjoy each sun-soaked day to the fullest. With a Westin Lagunamar Ocean Resort timeshare resale, you have the perfect sanctuary to relax in and reflect upon your memorable experiences. There is something fun for every member of the family at this popular Cancun destination. Westin Lagunamar Ocean Resort fractional ownerships offer your family the opportunity to spend the days relaxing in the massive and uniquely-designed infinity edge pool that appears to seamlessly spill over into the stunning Caribbean Sea. Complete with a swim-up bar, a huge shallow children’s pool, numerous soothing whirlpool spas, and an exhilarating water slide, countless hours can be spent simply hanging out poolside. Only a few steps away your little ones will be happily surprised when they discover the 18-hole miniature golf course. When the water sports and area adventure opportunities are added to the mix, adults and children alike can experience the time of their lives at The Westin Lagunamar Ocean Resort each and every day. The powdery sands that have made Cancun famous are only mere steps below the stunning overlook of the infinity edge pool. Here, you can feel the warm sand massage your feet while you stroll along the scenic and serene shoreline and let the warm, gently lapping waters of the Caribbean ease your worries away. Between interludes in the azure sea, you can kick back and relax in your own private cabana while you enjoy refreshing cocktails and tasty eats that are brought to you by attentive beachside staff. With endless relaxation on the shoreline, it can be easy to forget that the famous Mesoamerican Reef just offshore houses over 500 fish and coral species that can be enjoyed while snorkeling or diving. Cancun is famous the world over for its invigorating nightlife. From beachside tiki bars and swanky lounges to charming watering holes and huge ultra-clubs where the party never stops, the nightlife options are as endless as the views from the balcony of your Westin Lagunamar Ocean Resort timeshare. If you are interested in escaping to a tropical paradise year after year at this inviting Caribbean retreat, there are excellent Westin Lagunamar Ocean Resort timeshare deals currently available. The experienced real estate pros at Premier Timeshare Resale can show you Westin Lagunamar Ocean Resort timeshares for sale and help you find the perfect property for you. If you are looking to sell a Westin Lagunamar Ocean Resort timeshare, Premier Timeshare Resale can help you sell your timeshare as well, providing someone else with the opportunity to enjoy the best that the Caribbean has to offer year after year.